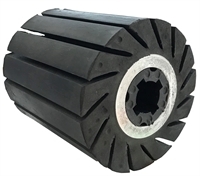 As an alternative to the inflatable tyres, which we recommend as the standard tyre for grain finishing, we also have a solid wheel available where a more aggressive cut is required. These wheels will fit on any 4" wide hand held abrasive machine with a 19mm keyway. Also Available: We supply a wide range of sleeve sanding belts. We also have a wide range of abrasive wheels to suit these machines.